Rockies Home Opener is Today! Colorado’s front range has experienced several days of absolutely gorgeous weather, in fact temperatures in Castle Rock have hit at least 70 in the last three days consecutively! 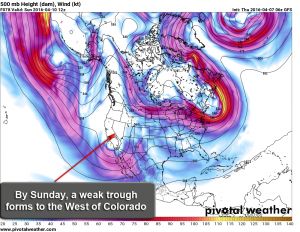 This is not unusual for Colorado in April, the month is normally punctuated by periods of warm, dry and windy weather followed by periods of cold, rainy, cloudy and even snowy days. I haven’t posted much the last few days because quite frankly, the weather has been a bit boring. I can only post, “it’ll be windy and around 70” so many times before folks lose interest. With that in mind, I’m posting now because I’m beginning to see some changes of an extended pattern change arriving as early as the latter part of this weekend. I’ll have a weekend outlook on Friday with the finer details of this weekend, but in short the next few days will be more of the same. Expect temperatures to remain right around 70, winds will still be a bit breezy but lighter as we go later in the week. It will be a great weekend to get out and about and I recommend everyone take advantage of it! 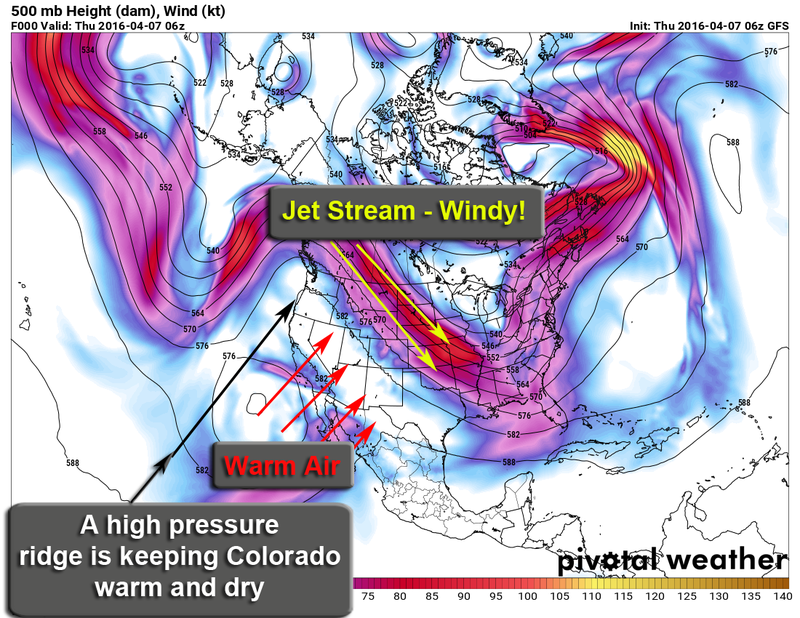 Ridging to our west is pumping warm, dry air in from the Southwest and the jet stream rests just to our North. This is what is responsible for our windy conditions for the past few days. In addition to the wind, this type of pattern steers storm systems away from us and to the North. 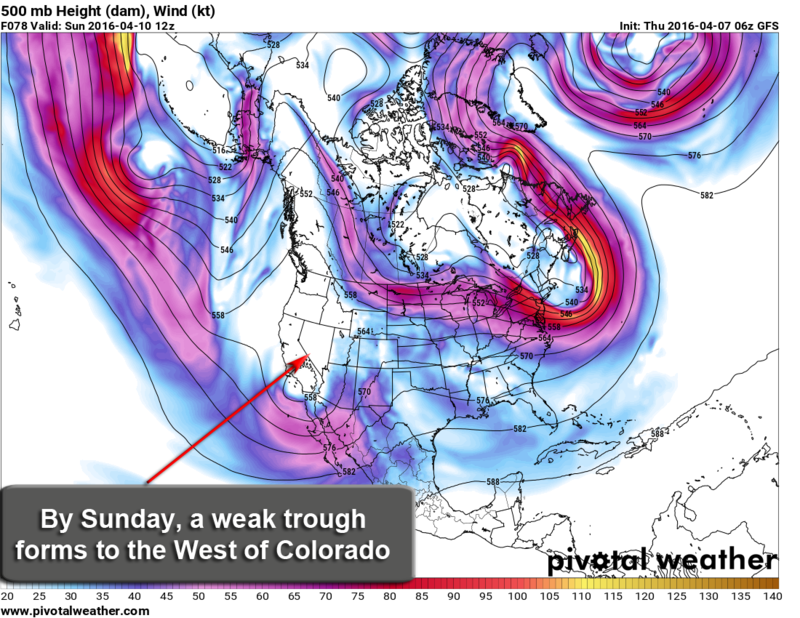 By late Sunday and into Monday we notice this pattern beginning to break down. Notice the big ridge to our West is now replaced by a trough. This generally means we can expect a cold front coupled with increased moisture in the atmosphere. At this time, the storm system looks rather weak as it moves across Colorado so I expect it to cool us slightly. Temperatures are projected to be in the low 50’s during the day and mid 30’s at night so most of this should fall as rain but I can’t rule out the possibility of a few snow showers here and there. By the middle of next week, we see a weak ridge establish over the state again. 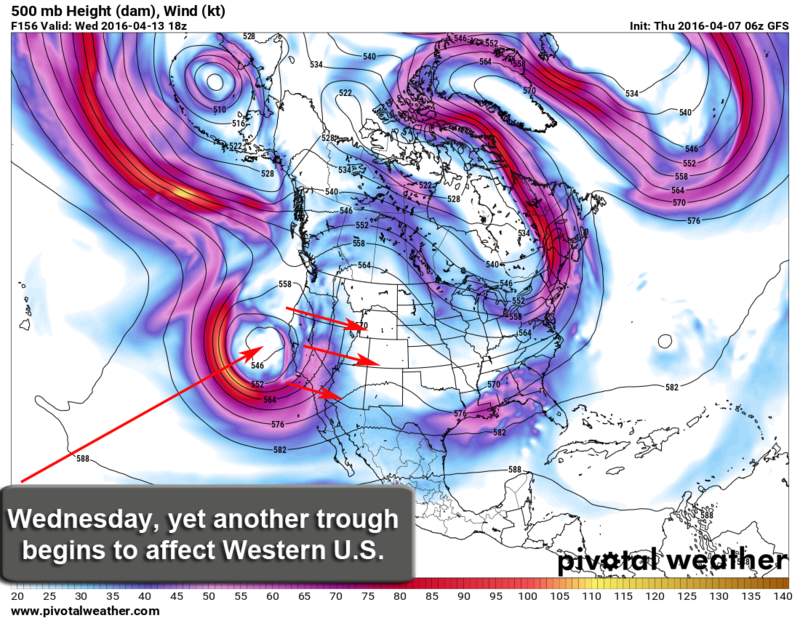 This would mean a brief period of warmer and dryer weather around the Wednesday/Thursday time period. (Some models have us flirting with 80 degree temperatures on Thursday!) This ridge will be short lived, look at the trough building to our West again! Notice that this particular storm system looks much better organized than Sunday/Monday’s system and as such we would expect to have a bigger impact from this system. Friday April 15/ Saturday April 16 — The Fun Begins? I’ll start off by saying that models predicting this far out are subject to huge change, but there is quite a bit of agreement on a powerful storm system during this time period. The biggest question is, where will it end up? Just like winter storm systems, spring and summer storm systems in Colorado are made or broken by where the storm system actually sets up. 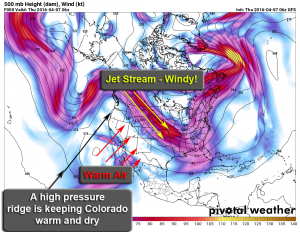 The trough maintains a lot of its strength as it crosses the Rockies which means it will have no trouble maintaining energy and pulling in moisture. At this time it doesn’t look particularly cold so I don’t expect much if any snow out of it. Should the trough tap into more colder air, snow is always a possibility but at this time its way too early to tell. Another interesting facet of this storm; with the warmth now in the lower atmosphere combined with moisture and energy could make for a chance for severe weather. This is something I will be watching closely for into next week. Get out and enjoy the gorgeous weather that is on tap this weekend. 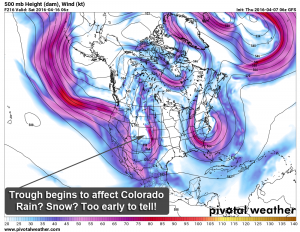 Next week we will begin the roller-coaster that is spring weather in Colorado. We will have some nice days next week but will have some equally not nice days as well. Stay tuned here as we will update with any forecast changes and of course, we’ll be keeping an eye out for a thunderstorm threat next week as well.